2019 Calendar “Creativity Cures the Soul” Monthly Inspiration for your Creative Spirit. 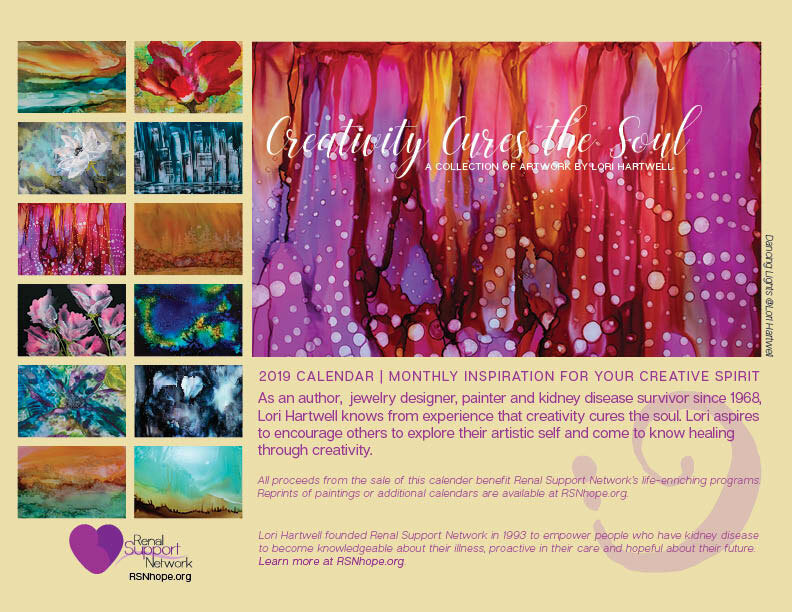 RSN’s beautiful 2019 calendar ‘Creativity cures the Soul’ encourages creativity and self-expression. Each month offers an inspirational ‘creativity’ quote and is accompanied by an original painting by Lori Hartwell. (Image pages can be reused, just cut out and frame each month’s illustration as a small art print.) It is an exceptional gift to show your appreciation to family and friends. Display this beautiful calendar at your desk or on your wall at home and co-workers or guest will be so jealous they’ll want to support RSN too! So, help us reach the people around you by donating at least $20, and then put your calendar where everyone will see it! If you would like to receive a calendar make sure to select “2019 Calendar ‘Creativity cures the Soul’ ($20)” on the donation form. This calendar makes a great corporate gift or employee incentive/award. Bulk pricing is available.